Take an escorted vacation tour of Northern Italy that begins and ends in marvelous Milan. You’ll begin with a welcome dinner in a fine Milanese restaurant, followed by two nights in the fashionable city to visit its Sforzesco Castle Grounds and Museum, Duomo Square, and see the world-famous La Scala Opera House. You’ll travel to Turin—former capital of Italy and birthplace of Fiat automobiles—where guided sightseeing includes a visit to the cathedral which houses the Holy Shroud. Enter Emilia-Romagna renowned worldwide for its gourmet traditions. Stop in Parma—of parmesan and prosciutto fame—and visit Modena for a Balsamic Vinegar tasting. 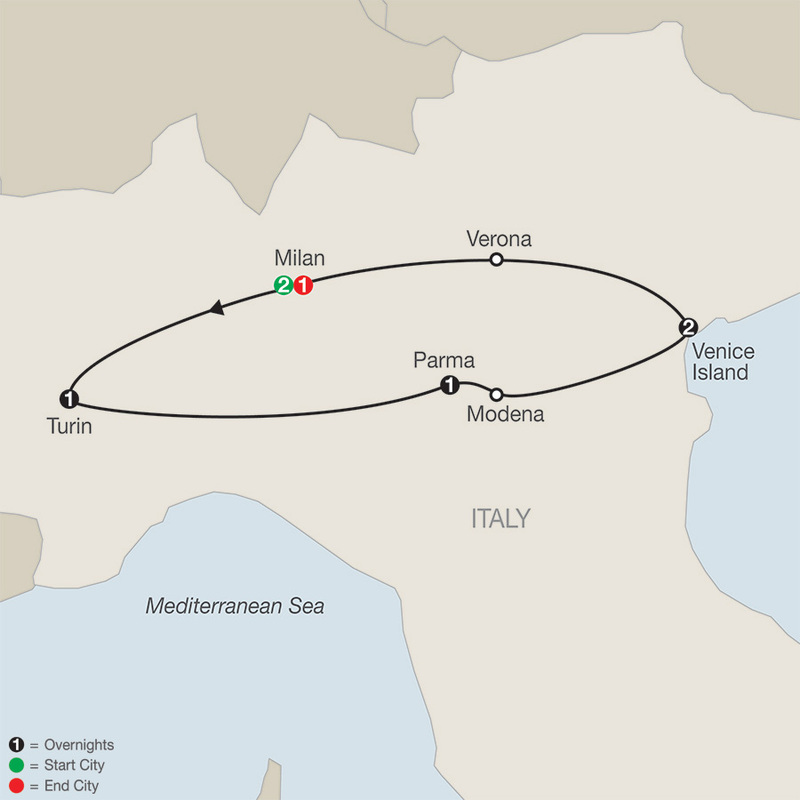 Next stop is Venice, a favorite destination for romantics and art lovers. Take a private boat ride and join your Local Guide for a walking tour to see St. Mark’s Square’s, its byzantine Basilica, the Doges’ Palace, and the Bridge of Sighs. Also watch the age-old art of glassblowing by a local artisan. Head to Verona—setting of the Shakespearean tragedy, Romeo & Juliet. Take photos of Juliet’s balcony, and see the pink-marbled arena of gladiator battles of the 1st century AD—now an exquisite venue for world-class opera performances. Enjoy an authentic Italian farewell dinner in Milan to commemorate your escape of Northern Italy, away from the crowds, and with savings to share on cherished mementos and experiences. "This historic 4-star hotel is located in one of the most prestigious palazzi in the heart of Turin, just a a short walk away from Piazza San Carlo and offers its guests an intimate and welcoming atmosphere, combined with great service. Free Wi-Fi internet access is available throughout the property. It has 139 rooms and suites with elegant and refined furniture . "